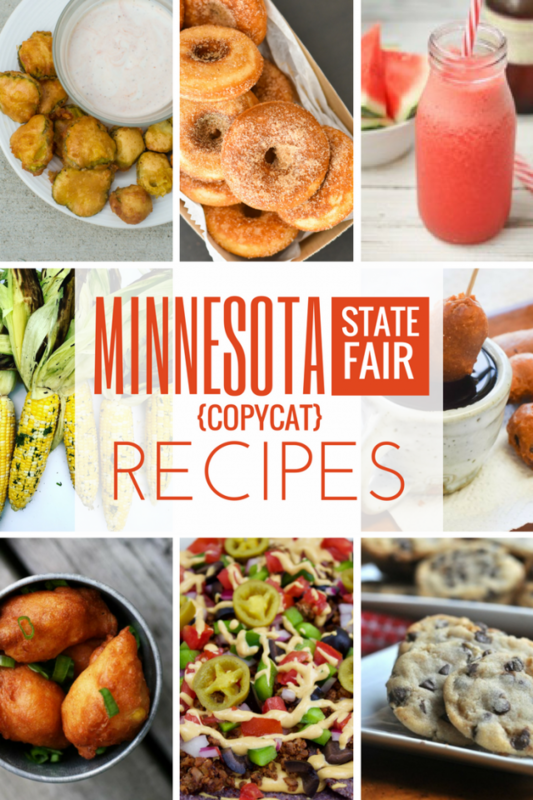 The Minnesota State Fair is, in my opinion, the most fun experience you can have in the Twin Cities. It’s the second largest state fair in the U.S., attendance-wise, behind Texas. In 2016, 1.9 million people visited the fair. It’s a grand 12-day event. And my favorite part about it – no surprise here – is the food! What Do You Eat At The Fair? I always get the fried green tomatoes. Be sure to try them if you go to the fair this year. They’re in the same booth as the corn fritters (they’re also really good!) The booth is located on the south side of Dan Patch Avenue, between Underwood and Cooper streets. 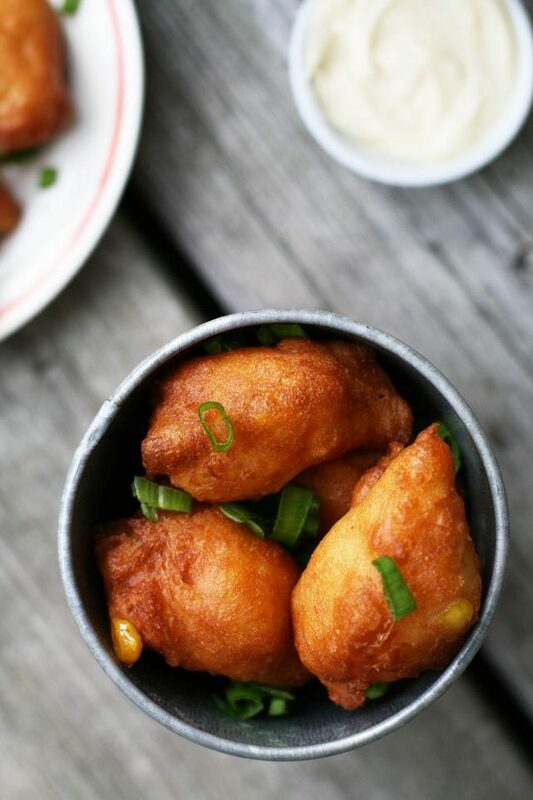 This recipe is inspired by the corn fritters. I considered making fried green tomatoes, but I wasn’t confident that I could do the originals justice. When I go to food at the Minnesota State Fair, I don’t hold back. It’s by far my favorite food event of the year. I like to try a variety of new foods, and I don’t think about nutrition at all. This is how you should approach this recipe: It’s not healthy. But it’s delicious. 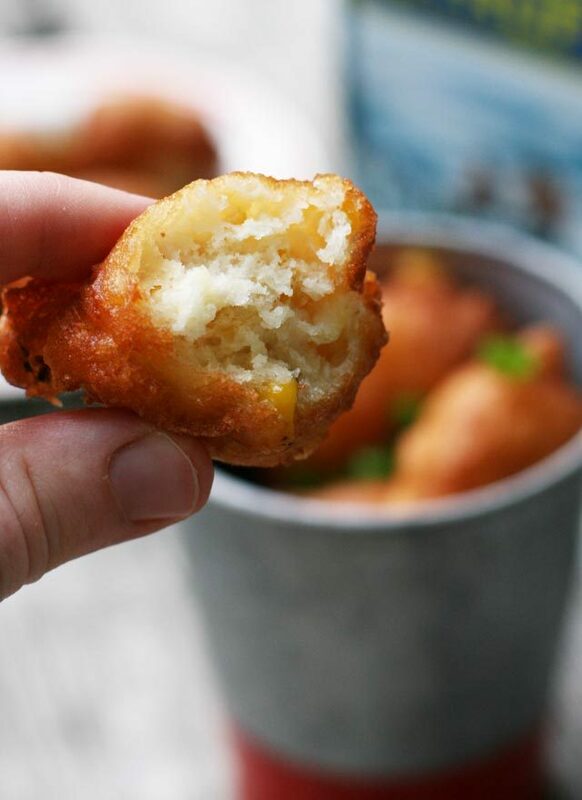 These fritters walk the line between dessert and appetizer. Imagine a less-sweet donut with corn inside, finished with a decadent maple butter glaze. Another great thing about this recipe? The cost. Pantry staples like flour, eggs, and creamed corn make this recipe extremely affordable. Do I need a deep fryer? No. You can use a heavy pot instead. What kind of oil should I use? Peanut oil is considered the best oil for deep frying. I used canola oil. You can also use coconut oil, vegetable oil, safflower oil, or avocado oil. A high heat oil is best suited for deep frying. How hot does the oil have to be? You’ll need to heat the oil to 365F. If you don’t have a food thermometer, you can test the oil by dropping a bit of the batter into the oil. If it sizzles, the oil is probably hot enough. If it doesn’t sizzle, keep heating the oil. Can I reuse leftover oil? You can reuse leftover oil once or twice. Once the oil has cooled, pour it through a fine-meshed sieve lined with paper towels or cheese cloth to remove any leftover fried bits. Store the oil in a cool, dry place. How do I dispose of excess oil? DO NOT pour leftover oil down the drain. Pour oil into a sealed container (a leftover glass jar works well) and throw it away. 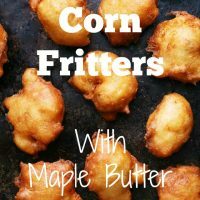 Serve fritters fresh out of the fryer.See deep frying 101 instructions above. To make maple butter: Beat butter and maple syrup together until smooth. 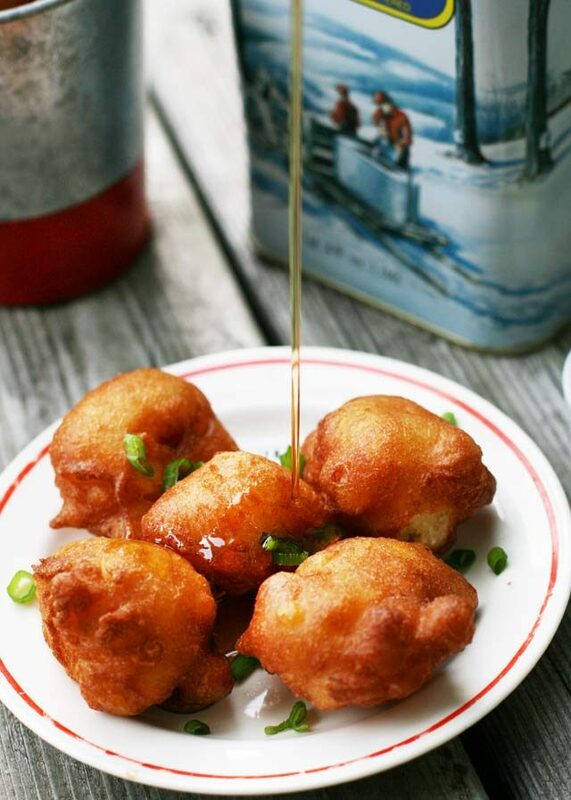 To make fritters: Heat oil in a heavy-bottomed pot or deep fryer to 365F. Drain most of the liquid from the creamed corn. In a medium bowl, combine flour, baking powder, salt, and sugar. In another bowl, beat egg, milk, and melted butter. Combine the dry and liquid ingredients. Add creamed corn and corn kernels. Drop batter by spoonfuls into oil. Fry until golden brown - this will take about a minute. Remove from oil, place on paper towels, and serve hot with maple butter. These look so perfect! Light, fluffy + a perfectly balanced sweet & savory snack. Thanks, Julia! They were indeed very light and fluffy. Swoon…these look like my heaven. I deep fry (not too often, usually I do it at my cabin) in my dutch oven which works great-I agree, not special equipment needed! 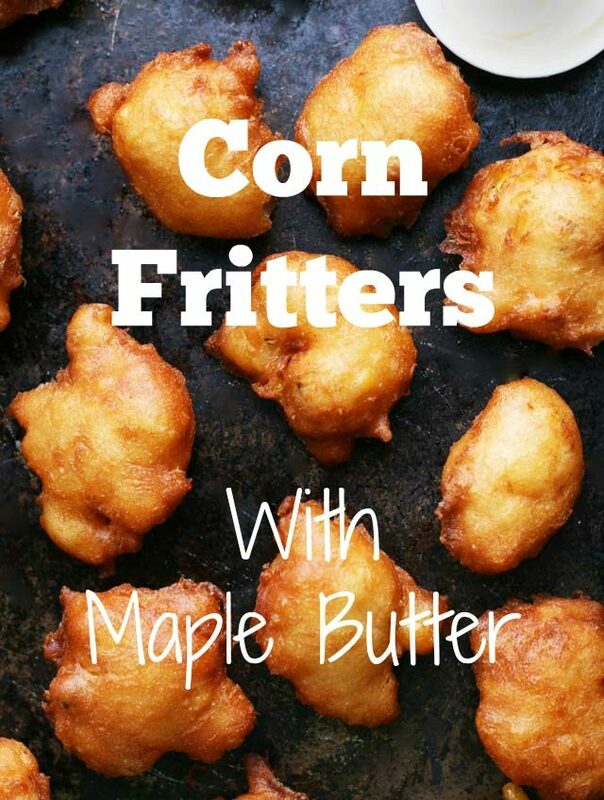 These are definitely fritters I’m going to make, they look fantastic! We have a deep fryer and I am ON these. They look sooooo yummy! Can we have a deep fryer party at your place sometime? Plz?? Yum! These look so delicious! I’ve never tried them at the Fair, I will have to check out these and the fried green tomatoes!